Amsterdam is a city in constant motion, with a strong cultural climate and a rich history. The historical city, its labyrinth of canals and distinctive old canal houses are famous throughout the world. In August 2010, the Amsterdam canal belt was even added to the UNESCO World Heritage List! Behind the facades of Amsterdam, that ever lively and widely renowned city, many surprises are hidden. The city’s rich history and the creativity and sharp commercial spirit of its multicultural inhabitants are reflected in the diversity of its interiors. There are houses that still display their past lives, unaltered, as well as innovative and contemporary interiors that satisfy the needs and demands of today, equipped with the very latest devices. 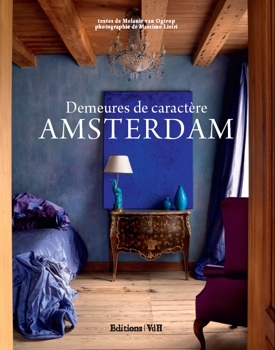 This book treats the reader to a glimpse of the stylish and artistically decorated houses that Amsterdam is so rich in. The celebrated Italian photographer Massimo Listri, known for his many interior books, and author Melanie van Ogtrop joined forces to select forty interiors of enthusiastic residents, artists, collectors, and a few antiques dealers. contact VdH Books for more information.